My name is Gil Polanco and I do stuff. I love playing and building drums. Most people who know me know that music has always played a big part of my life. A lot of people don't know that I am also one of the unwashed masses that aspires to become a writer. Back in 2010, I published "For Reals! Observations by a Brown Guy" through a publisher I no longer work with. Due to some issues I had with the contract, I left out quite a bit of material and the result was more of a pamphlet than a book. 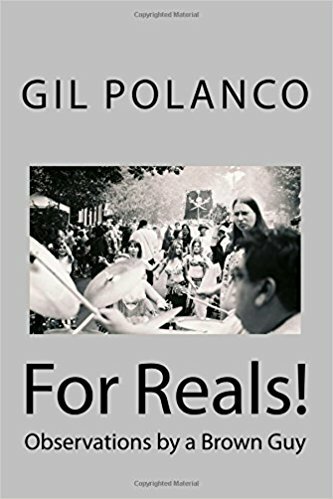 I got back the rights to the book last year and spent this time adding material and editing the slightly anticipated Second Edition of "For Reals!" The book has twice as much material and I think it's twice as fun. I am very pleased to announce that this new, improved edition is now on sale at Amazon. Click on the image below to purchase. Okay! There's a pile of stuff to say about my involvement in the music world. I will put more stuff in later but, for now, I will say that I've been Playing drums for more than a week. I currently play with Eddie & The Allniters, Cajun Blue, and The Whitinos. I've recorded with The Lesti Huff Band, Whitinos, True Stories, The Lavens, and Lee Woods. I am stupid for drums. I've own several kits over the years and I've been building/refurbishing drums lately. I will be posting pics soon.